Hi guys! I mentioned last week that I had a few announcements and I am finally ready to let you in on one of them. Throughout June to August I'll be bringing you three weekly segments! I don't want to reveal too much yet, but this post is one of those segments. Wedding Bliss is now the official title for weekly wedding inspired manicures and will be continuing until the end of June. This segment is part of the Preen.Me VIP program showcasing James Allen limited edition Nail Jewels, which are inspired by their most popular diamond rings! 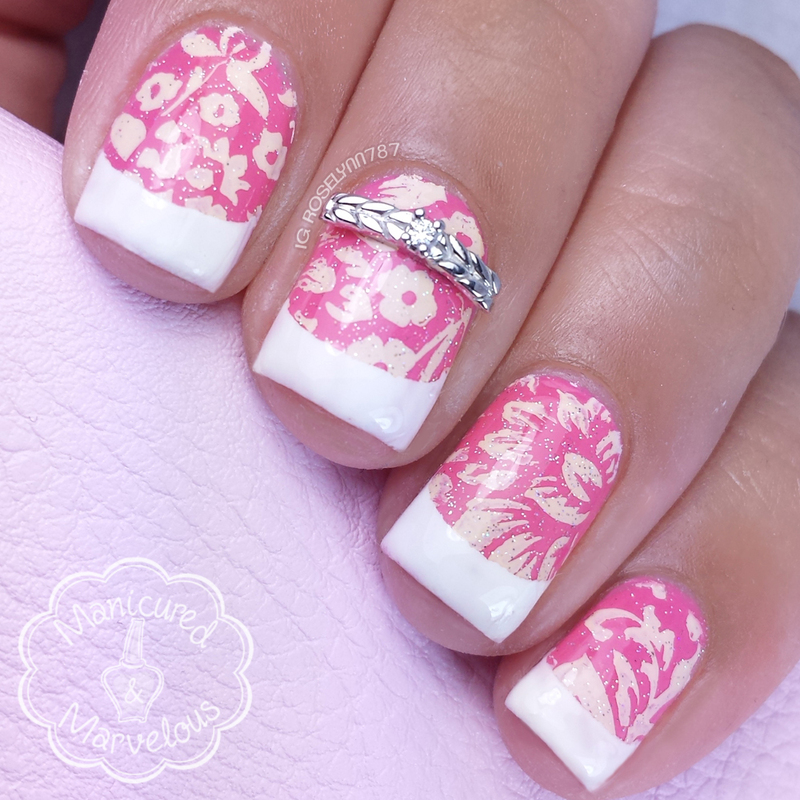 As a bride to be myself, I am busting at the seams with manicure ideas for my big day! One of the many ideas I've had is having a tropical 'Hawaiian' type of wedding. I don't think it'll actually be possible for our budget, but at least my nails can live the dream. 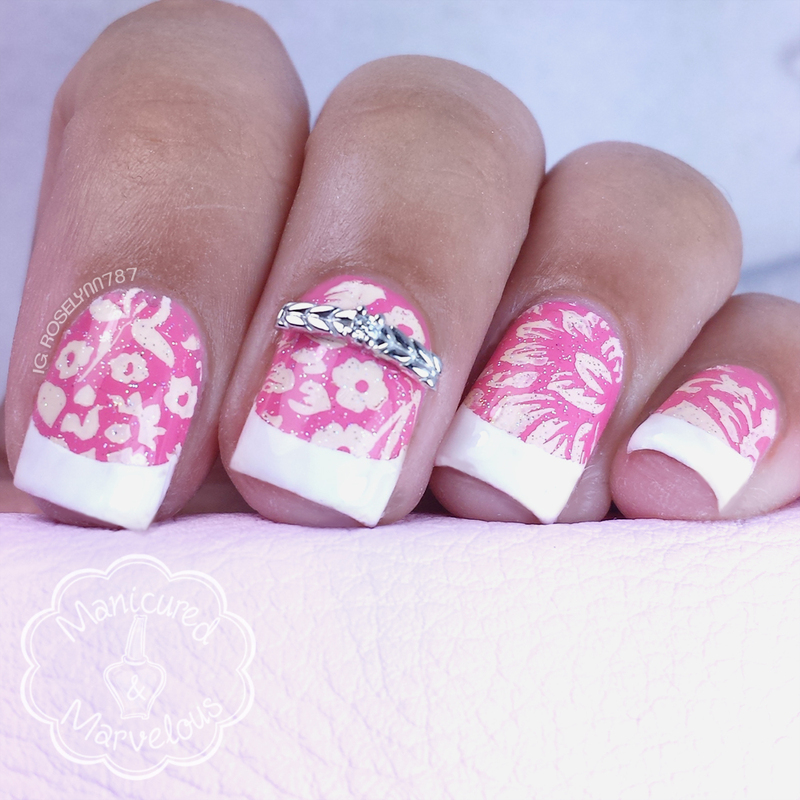 The mani itself is a really simple and easy look to achieve. So much so that I actually ended up doing this fifteen minutes before going into work in the morning. High five for working under pressure, haha. Start off with a pink base, here I am using Cotton Candy Sunsets by Polished by Alexandra (which I reviewed yesterday). 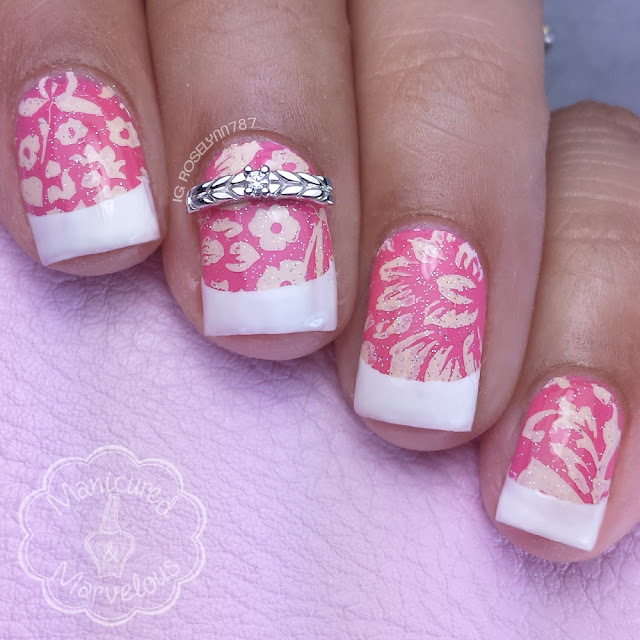 Using Pueen Cosmetics Stamping plate 72 from the Buffet Leisure Set, I stamped over the pink with a cream color polish from Mundo de Unas. I let that dry and then added a bit of the always beautiful Fairy Dust from China Glaze. Giving that a bit of drying time, I then created the french tips using a circular band aid. I know it seems a little weird, but I actually learned how to do frenchies when I was seven years old this way. Throwback! After that I just sealed in my design with Seche Vite topcoat. On my accent nail giving this manicure the perfect finishing touch is the gorgeous wedding band inspired charm from James Allen! One thing about Wedding Bliss is I am going for 'out of the norm' nail ideas here. I might do maybe one traditional look just for the sake of being dainty haha. I'm still drafting up ideas for the later weeks in the segment, so let me know if you have any that you'd like to share and have created! What a pretty look! That band is divine! Omg these are gorgeous!!!! Absolutely stunning! Super cute!!! Love the quirky take on French tips!!! Those look really high quality and realistic! I love this look! It's so bright and delicate at the same time! Great job! Oh I love your inspiration! You captured everything so well. Those nail charms are to die for. So gorgeous!! Love the charm, it's just perfect! These are so pretty! I love the sparkle! I love this! Very elegant! Oh this one is lovely! It fits your nail so perfectly! Oh that's cute, and something I'd totally wear with a beach wedding :D! I really like the wedding band charm! I can't decide what I'm going to do on my nails for my wedding. Too many options!